Men’s Suit Repair 101: I Ripped A Hole In My Suit Pants (Or Suit Jacket)… Can I Get It Fixed? Have a hole in your suit pants or suit jacket? Suit repair for ripped, torn, or snagged suit pants and suit jackets is called suit reweaving — or invisible mending. A men’s clothing expert shares 2 ways to avoid having to get your suit pants and jackets reweaved, and places to get suit reweaving done. I Have A Pink Tie, What Should I Wear It With? Wondering what to wear a pink tie with? A men’s clothing expert shares what you can safely wear a pink tie with, and which items of clothing you should steer clear of. 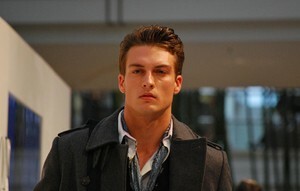 There are 3 classic styles of mens dress coats: Trench coats, Top coats, and Overcoats. Here’s when to wear each one with your sport coats and dress trousers. 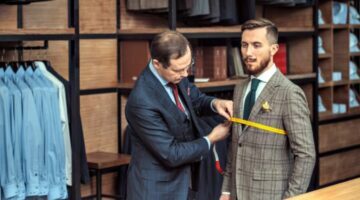 If your suit jackets don’t seem to fit quite right and you have a large gap between your chest and the lapels, then here’s what you need to know about proper men’s suit jacket sizing and how to prevent this from happening again in the future. A pink dress shirt is as much a staple in a man’s wardrobe as a white dress shirt is. The key is in selecting the correct tone. 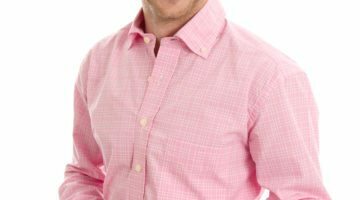 You want to select a blush or rose color shirt which complements the skin tone of most men, not a bright or bubblegum pink shirt. It’s not so great being tall when it comes to finding clothes you can wear… and look good in. You’re either showing too much socks out the bottom of your pant legs, or you’re forever tucking your shirt tails into your pants. Here’s how to find clothes for tall men. Seasons change. Summer is on its way out. And autumn is on its way in. If you’re a trendy guy, then you know that it’s time to prepare for the change of seasons. Here are some fall trends for men. The navy solid suit is without question the most important suit you will ever own. Here’s why. Plus, tips on how and when to wear the mens navy suit. While these Brooks Brothers shirts are not custom made, they are certainly worthy of consideration for the man who is looking for quality, performance, style, fabric selection, fit, and many other options that allow you to create your own individual style. The following steps are your guide to knowing what size suit you really wear. 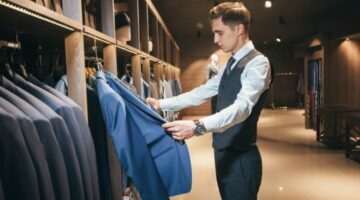 Here are the steps to a properly fitted ready-made suit — both, what you should expect when being fitted for a suit AND what you should request in order to leave with an elegant, tailored finish to your suit. I don’t recommend buying an extra pair of suit pants for EVERY suit, but I firmly believe that the 2 suits that every man needs are: 1 navy solid suit and 1 charcoal gray solid suit. And to complement your basic business wardrobe, you should buy 1 additional pair of matching pants for each — your navy suit and your charcoal gray suit. if you’re on a budget, then you want to focus first on the bare necessities when you’re putting together your business wardrobe. Here are the exact colors and quantities of suits, shirts, ties, and shoes that you need to have in your closet! If you’re spending a couple hundred dollars each month dry cleaning your suits, it’s time to stop! Good news: you don’t need to dryclean a suit after every wear. Here’s how to keep mens suits fresh and clean and free of wrinkles in between dry cleanings. Do you know what colors, patterns and styles you should wear to your next job interview? Are you going for an interview? Find out how wearing the right clothes may help you gain a competitive edge.